Every successful investor has one thing in common: completing the purchase of a first investment property. While the process can appear to be easy while buying, making good decisions is what separates a successful investor and a newbie. Getting started the right way to understand the passive investing industry will help guide an investor to make smart investing choices and decisions. This beginner guide to turnkey property investing will remain updated with new content for real estate investing business seekers. Many homes that are purchased through an organized agency can be used as investments by new investors. A home marketed as "investment property" will be one that is expected to be purchased by a potential real estate investor. There are different types of these investment homes available and this can lead to confusion by beginners. A turnkey or turn key investment is one that is already renovated and sometimes can have a tenant in place. This provides an open door to investors who do not have the time or the resources to find qualified renters to help make the home profitable. A flipped home is one that is purchased at a discount and then fixed up in hopes of earning money from the sale. Homes that are flipped are sometimes turned into rental homes that are marketed as turnkey depending on the seller. The best types of houses are ones that have tenants locked into a long-term agreement to help earn passive income from day one. Depending on the company offering the home, there could be disadvantages that come along with the purchase of a house. The first disadvantage is lack of property management. Buyers who often buy a property without management included must perform all of the daily work as a property owner or landlord. This can be next to impossible for an investor who lives in a different part of the country compared to where a home is actually located. The selling prices that are found with some turnkey property services can be higher than what a flipped home would sell for. This is a case where the company selling the home has inflated the upgrade or repair expenses and a buyer will pay the difference on the complete purchase. Some companies make immediate profit off of these types of sales and performing local comparisons of similar properties can help an investor determine the best price to pay. 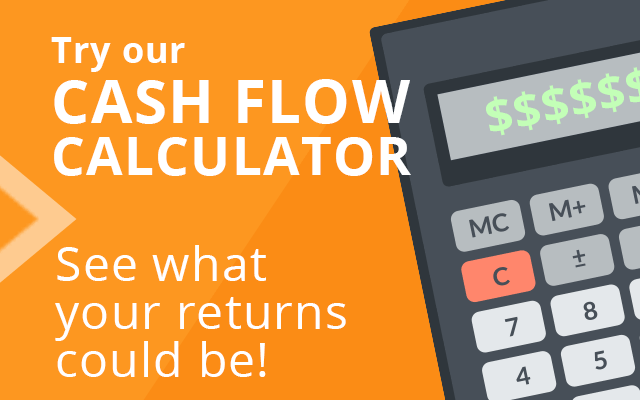 Cash flow decreases can be common with a home that is rented due to many reasons. Homes that are in or around poor economic neighborhoods can have difficulty turning a profit. High tenant turnover due to job loss or crime can affect the profitability over the long term for a passive income investment property. A home that is positioned in a nice area can usually attract long-term renters. Financing can be a problem during some real estate transactions involving an investment house. Not every seller is willing to provide internal solutions to help outside buyers make a purchase. Bank or lender financing might be required for a person who cannot come up with the funds through cash or retirement savings to buy into a turnkey home for sale in an expanding market. Every property will require maintenance to be performed when exterior or interior elements need fixed. This is an added expense of owning a property in the 21st century. One advantage that owners of investment properties have is the resources provided by a property management company. Professional agencies often have discount contractors who can perform work at or below the average market rates for repairs or upgrades. This is a bonus for property owners. Day-to-day management of a home that is located in another state has challenges that some buyers might find unexpected. A turnkey home that comes with the option for property management is a good thing to have. Allowing a professional to handle rent collection, payment of property taxes and coordinating repairs is a small price to pay compared with the frustration of performing all work alone. The cap rate is one of the most important elements when evaluating a turnkey home for sale. The rental market is one that provides a good growth pattern for cap rates in the U.S. A turnkey home should always have a growing cap rate based on the local economic growth and the long-term rent history of a tenant. Property managers can help with calculating cap rates to make sure investors know how much profitability is currently in a home for sale and what types of returns can be expected in the future. There are tax advantages that are available for some property owners who meet federal or state guidelines as investors. Because owning a rental home is considered passive income, certain expenses can be deducted from taxable income at the end of the year. This reductions in taxes is an added benefit apart from the tax savings that someone with an LLC, corporation or other business structure would receive as a real estate investor. Once a decision is made that passive income investing is the right industry for an investor, choosing a company to work with is important. The advantages and disadvantages of owning a property are clearly known although wise decisions must be made about where to buy a cash flowing rental. One way to evaluate a company is to examine the track record of past sales and clients. Top companies have hundreds of current clients, a high BBB rating and show results annually for building client wealth. Properties located in a key market will always have the chance to be profitable for investors who make good decisions in the beginning. 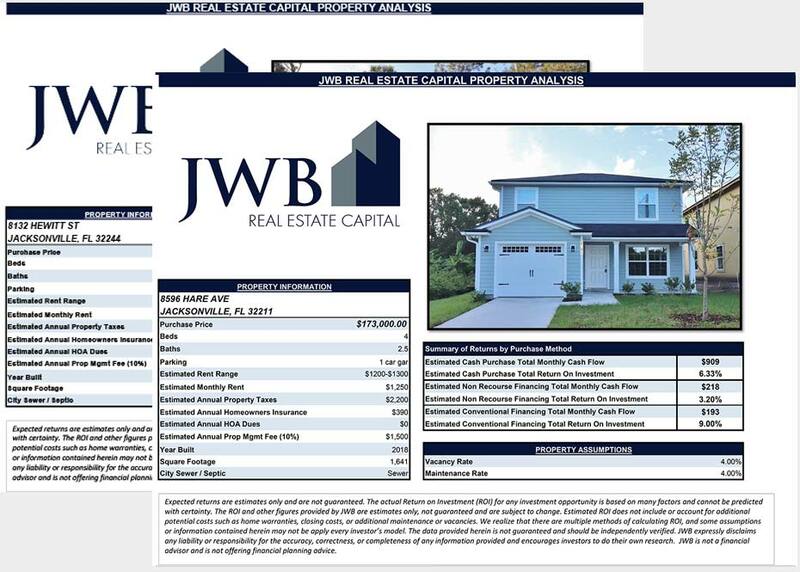 The information contained in this guide should help kick-start the investing career of someone who lives in any state in the U.S. who is ready to buy a turnkey property for sale through the JWB company or a comparable competitor outside of the state of Florida.